The 'flash forward' is one of the most over-used devices in comics. I understand the impulse, particularly in serialized storytelling, to open on mystery or action - or, in the case of Wolverines #1, to open on a mystery 6 months in the future, then action 1 hour in the future, then start the story - to grab readers more immediately, but if all you're trying to do is trick readers into buying your book, well, we can tell. And, speaking for myself, we don't much care for it. A good flash-forward instills a sense of dread, suspense, or tension in readers, makes us need to keep turning the page, informs everything we see until we're caught up to where we were, often defying our expectations in getting there or vitally altering the context of the scene in question. Wolverines #1 flashes forward to a fight scene, and then three pages later shows the characters all get ready to start fighting each other. But hey, those of you worried that a book about a bunch of fighty guys will indeed contain a fight, you were reassured two whole pages early. Wolverines #1 picks up shortly after The Death of Wolverine, in which he died fighting against the very people who made him - and, in the process, freed a group of young men and women who were experimented on the same way he was. Unfortunately, those people are all slowly dying, victims of a safety measure meant to ensure they couldn't survive outside the compound. Their solution? Kidnap a group of Wolverine's friends and enemies, try to find a way to use their healing factors to keep everyone alive, and force them to help recover Wolverine's adamantium-coated body for some reason. Unfortunately, it turns out a giant block of adamantium shaped like on of the world's greatest heroes is in hot demand, because they aren't the only ones after the body. The issue does a bad job at setting up some key conflicts for readers who haven't read The Death of Wolverine and its accompanying spin-offs and tie-ins. We're told in the 'Previously On' summary that the new characters have 'control words' that help them keep Sabretooth, Mystique, and others in check, but throughout the book, what that means, exactly, is never explained, nor why Mystique and company would also die without Wolverine's body. There's a lot that isn't explained, unfortunately, despite the characters speaking in copious amounts of exposition, because it turns out have ten leads and six villains in a single issue tends to push subtler concerns out the window fast. Which is too bad! Making bare exposition visually or dramatically satisfying is difficult, something neither writer Charles Soule nor penciller Nick Bradshaw feel terribly comfortable with, but there's so much of it that everything else is simply crowded out. Bradshaw's brief fight scenes are slow, stiff, and lifeless, looking more like action figures with too few points of articulation to stage a convincing brawl. Part of the issue, however, may be the issue's length - with two flash-forwards and a ton of exposition to push through, Bradshaw is left with little room to let his characters move, to give the action any dramatic weight beyond a 3-panel sequence. Action is, at its core, just like any other form of drama, dependent on rise and fall and based, when done right, in character. Bradshaw simply doesn't have any room to do any of that. Which is unfortunate, because he does some solid work elsewhere. His layouts are largely excellent, using two-page spreads to open up his use of space during the fights and give the characters at least a little room to breathe. When it's just two characters talking, he shows a solid instinct for framing the scene and massaging some feelings from the figures, and he works well with colorist FCO Plascencia to give a few scenes some pretty concrete emotionality that helps sell a couple of the book's most pivotal moments. The book's best moments are the few-and-far-between character bits, at which both Soule and Bradshaw really excel. The highlight of the issue is a brief conversation between Mystique and Endo. In it, Soule digs at an interesting question: How does Mystique know what 'herself' really is? If she's been shapeshifting since childhood, how does she know that her blue body is her 'real' body, and not just something she thought looked neat as a kid? And when you're that lost in the changes you undergo, how do you find yourself again? 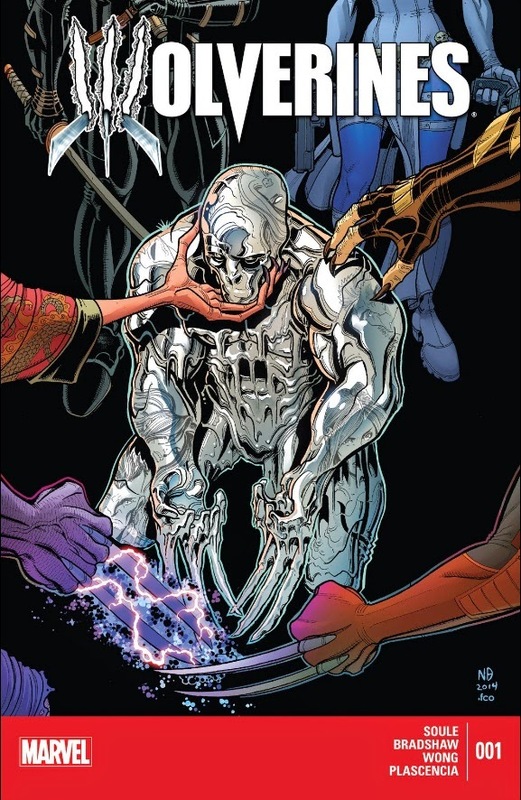 It's an interesting question, one that strikes at the heart of what has been done to these five new characters (and much of Wolverine's supporting cast), and I hope to see Soule build on the idea moving forward. But here, it's given short shrift in a book that's split between too many characters doing too many things, and far too few of those things are terribly interesting. Soule is an immensely talented writer, but his gift has always been for character, for finding the beating dramatic heart of a book and poking at it. There's a reason, I think, his best books are typically solo books like Swamp Thing and She-Hulk. In Wolverines, there are occasional flashes of inspiration, particularly with Daken and Mystique, but by and large, Soule's voice feels buried under an avalanche of market-ready tie-in-friendly franchising opportunities. 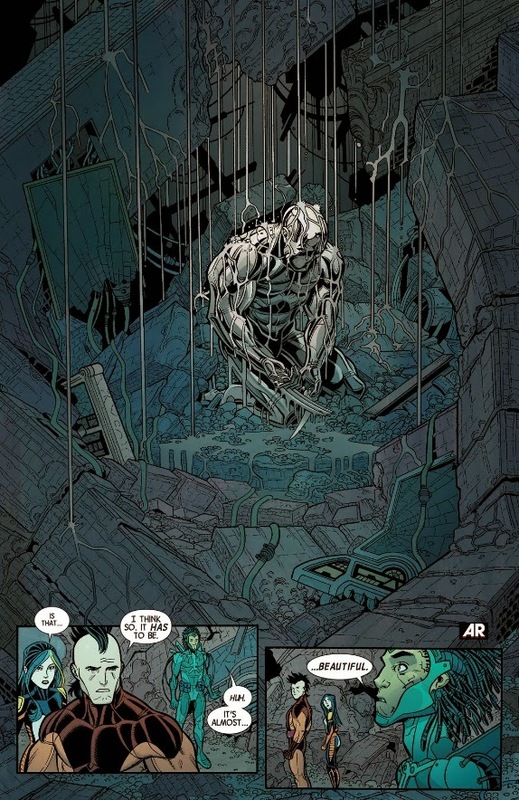 Wolverines #1 was written by Charles Soule, penciled by Nick Bradshaw, inked by Walden Wong, colored by FCO Plascencia, and lettered by Cory Petit. Published by Marvel Comics on January 7th, 2015, Wolverines #1 has a list price of $3.99.